If you haven’t been following the dev chats in the WordPress Slack team, there’s a lot of confusion around exactly when WordPress 5.0 will ship. Release Candidate (RC) 1 is out now, and RC2, as I write this, is around the corner. These should signal that the answer is “soon” but there has been no commitment. The team is ignoring the fallback dates in January, and it seems “as soon as possible” is the current target. Many have already written thoughts on what that means for the community. I’m here to tell you what your plan should be. Note: a “release candidate” is a version of software that the development team feels is ready to ship, but wants more testing on it. Ideally when RC1 comes out, making major changes stops. In my opinion, Matt Mullenweg has made his feelings as clear as he can without explicitly stating it: WordPress 5.0 and Gutenberg are for new WordPress users. My own feelings aside, that means that if you’re starting a new WordPress project from scratch, I think you should at least consider using WordPress 5.0. Make a list of the types of content you’ll need, plugins you plan to use, and a theme (if you’re not coding from scratch). Find out if they work with Gutenberg / WordPress 5.0. If they do, great…you should move forward with WordPress 5.0 . Because ultimately, you’ll need to at some point and it is a better experience for new users. For the 30% of the web that is already using WordPress, you’re faced with a decision: do you risk upgrading a potentially rushed project for the sake of being on the latest, or wait? The fact that there is not an official date means enterprises have no lead time. The WordPress project is not considering enterprises or larger organizations. Because of that, I think no enterprise should give any consideration to WordPress 5.0 – or specially Gutenberg. You should upgrade and immediately install the Classic Editor, or stay on 4.9 and perform only security and maintenance updates. Though be cautious here. While we can reasonable assume security updates will be backported to 4.9 for a while, there is no guarantee. Note: “Backport” is a term that means some patch – a security or bug fix for the current version – goes to older versions. When we hear that software versions are at end of life, or no longer being supported, it means that they will no longer have fixed backported to them. Again: my recommended plan is to upgrade to WordPress 5.0 and immediately install the Classic Editor. While Matt has also said this, I’m not saying this as an endorsement of his release plan. He leads this project, so it’s up to him to take care of his users, and not just give them a stopgap. 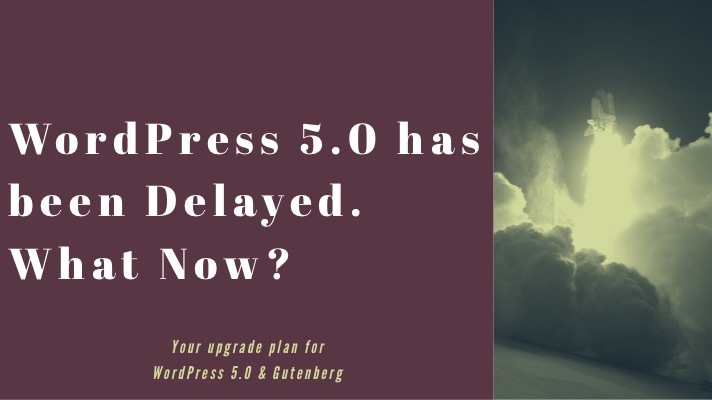 On that note, many hosting companies have decided that at the very least, they will not allow upgrading to WordPress 5.0 until the January. You should reach out to yours if you intend on using it before then, as they’ll likely have a workaround. Why the Rush with WordPress 5.0? This is the question on the minds of many: why the rush? Leadership hasn’t given us a clear answer. And as a result, it makes communicating with our clients and users very difficult. I’m not going to speculate on why. I’m just going to tell you we don’t have a clear answer and we probably won’t get one. I’ve spent a lot of time creating resources to help folks get ready for WordPress 5.0 and I ultimately believe it will be a better experience. I catch the drift that most do. But in my opinion, this is being handled disastrously. So if WordPress 5.0 comes out this year, I can’t tell people to upgrade. Educate yourself and your clients on it, but be cautious about making the switch.